The extent of domestic, gender-based violence (GBV) across the occupied Palestinian territory (oPt) is believed to be significant. A 2010 survey by the Palestinian Central Bureau of Statistics (PCBS) revealed that 37 per cent of married Palestinian women had been subject to violence by their husbands, while nearly two-thirds of them (65.3 per cent) reported that they chose not to report the violence: only 0.7 per cent of these women sought assistance from specialized organizations. The survey indicated that the incidence of GBV in the Gaza Strip is significantly higher than in the West Bank. "Does a man have the right to hit his wife when she disobeys him?" Literature on the subject and anecdotal evidence collected by aid agencies also suggest that situations of humanitarian hardship enhance the patriarchal nature of communities and increase the vulnerability of women to domestic violence. A recent study on gender equality in the Middle East and North Africa, for example, found a clear linkage between exposure to “occupation-related violence and adversity” and “increased experiences or perpetration of intimate partner violence”, among other ramifications. Palestinian communities in Area C of the West Bank, the Jordan Valley in particular, have been identified by humanitarian agencies as among the most vulnerable groups in the oPt. The restrictive planning regime applied by the Israeli authorities in Area C makes it virtually impossible for Palestinians to obtain building permits and impedes the development of adequate housing, infrastructure and livelihoods. Along with restrictions on access to farming and grazing land, plus other constraints, this regime contributes to the creation of a coercive environment for residents and the risk of forcible transfer. 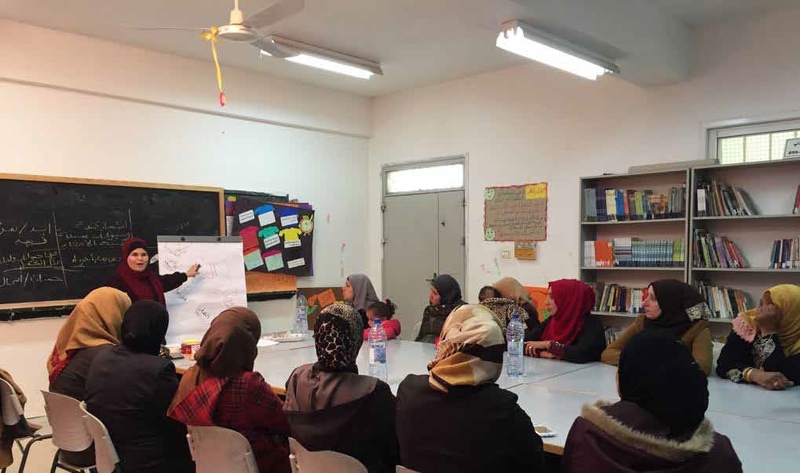 In July 2017, two humanitarian NGOs (AVSI Foundation-Italy and the Youth Women’s Christian Association-Jericho), with financial support from the Italian Agency for Development Cooperation, launched an intervention addressing GBV in five Area C communities in the Jericho governorate. Completed in March 2018, this was part of a larger project that included the provision of medical services, and the rehabilitation of toilets and drinking points at schools. The first component of the project entailed a survey targeting 151 residents (132 women and 18 men) of the five communities selected and addressing a range of issues that included domestic violence against women and children, early marriage, forced marriage and awareness of assistance mechanisms. Almost half of the respondents (46 per cent) reported that they had been subject to violence (mostly physical), a third indicated that they believe that violence by husbands is the result of abuse or neglect at an early age, and over 36 per cent pointed out that culture is an additional factor behind this practice. More than 46 per cent of those surveyed believe that violence against women by their husbands is a legitimate practice, while more than 87 per cent indicated that women should not report domestic violence. The vast majority (more than 90 per cent) did not know where to go to report domestic violence, while less than 10 per cent indicated that they would report the incident at a police station. The survey revealed a high percentage of early and forced marriage: 36 per cent of the women surveyed reported that they married when they were less than 18 years of age, while 22 per cent said that they married against their will. The second component of the project, implemented from October 2017, involved a series of workshops (“safety audit groups”) in six schools serving the selected communities. The workshops carried out in each school entailed a series of six sessions with students and two sessions with parents. The sessions offered an introduction to GBV, women’s rights and early marriage with the goal of mitigating the occurrence of GBV and raising the girls’ awareness of specialized organizations and the GBV referral system. All participants took two tests, one before the workshops and one at the end, and these reflected an overall improvement in their awareness about the issues addressed. "Do women prefer to keep silent about violence practiced against them due to psychological and social reasons?" A concluding event entitled “My rights are my protective shield” was held on 6 March in Jericho with the participation of local authorities and representatives of civil society organizations. The participants heard the personal experiences of a student and a mother who took part in the workshops, and shared ideas about strategies for addressing GBV in Palestinian society. The project was presented by the implementing NGOs at the GBV Working Group of the Protection Cluster with a view to replicating the intervention in other vulnerable Palestinian communities. * This article was contributed by the Association of Volunteers in International Services (AVSI) Foundation. UN Women and Promundo, Understanding Masculinities, 2017, p. 243.